Results and some critiques below the show photos. Click HERE to get there. SBK Nynäshamn, September 25 2004. From the left; Mrs Willemine van Deijl (Holland), Me and Pascha, Mr Hans Reinders (Holland) and Mrs Berit Foss (Norway). BEST IN SHOW VETERAN ! 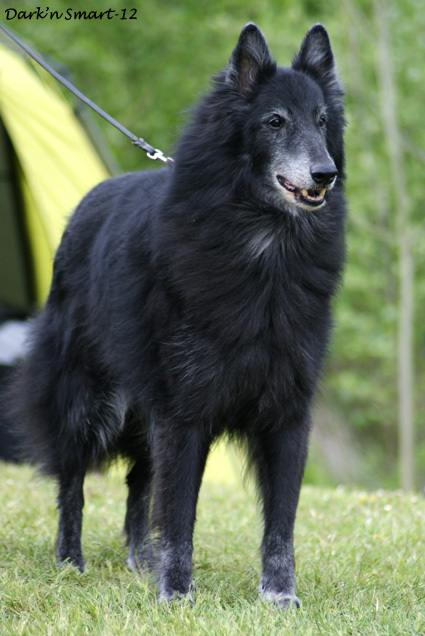 Velamsund Breed Specialty 2008.09.13. Judge: Mr Arve Larsen. 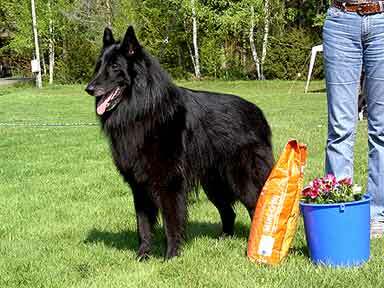 7:rd Belgian Shepherd Show Groenendael of the Year 2012! Honoured veteran over 10 years. Winner of "Twinkle in the eyes"
12 years. Complete scissor bite. Beautiful male of excellent type. Excellent length of head. Very good chiselling. Beautiful black eye. Medium ear, well placed & used. Beautiful expression. Excellent outline. Very harmonious. Excellent length of leg. Still with excellent top- & underline. Presented in excellent coat & condition. Little close coming & going. Very good side gate, still with good drive. Excellent character. 2011.12.10 Swedish Winner Show, Stockholm. Excellent size, masculine dog, excellent head type. Still wonderful shape. Lovely long, well chiselled head. Parallel skull, high set ears, still very expressive. Lovely neck. Well angulated, square in body, good substance. 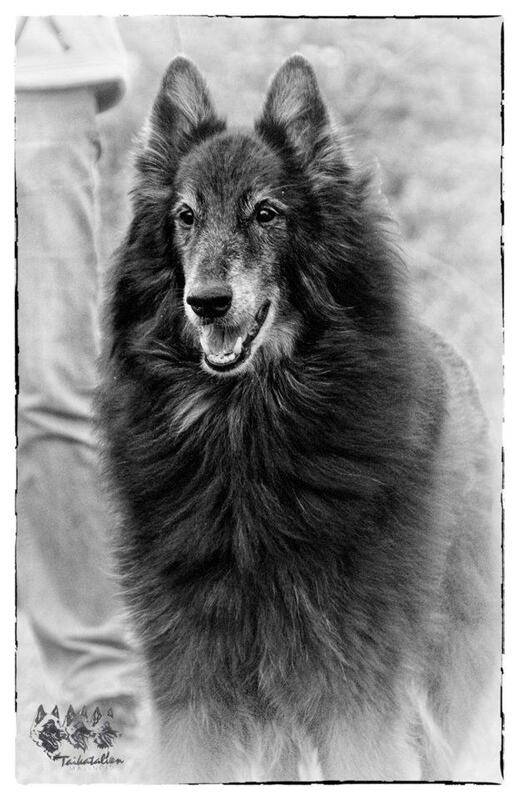 As a youngster he must have been very beautiful and he still is beautiful. Moves coordinated. Shows slightly age in back hind. Still all teeth, and beautifully clean. 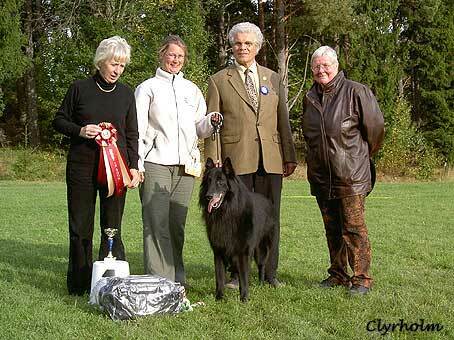 4:rd Belgian Shepherd Show Groenendael of the Year 2005! 2005.08.06 Swedish Breed Specialty - The Belgian Weekend - Stockholm. Complete scissor bite. Big male. Good construction. Good angulation. Good coat. Beautiful long head, dry. Brown eyes. Good expression. Ears well carried. Good parallellism and stop. Good neck. Tail high set. Good bone. Good presentation. Excellent caracter. Happy tail. Good movements. 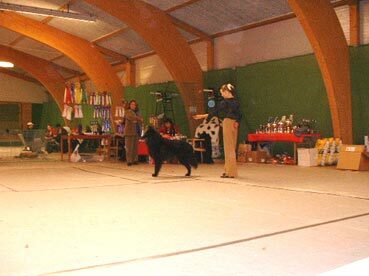 2005.03.27 Swedish Kennel Club, Stockholm. 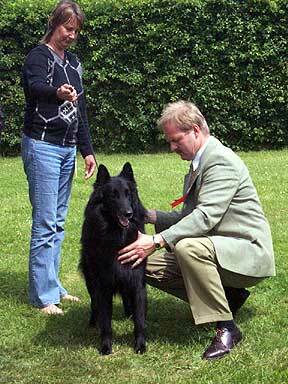 3:rd Belgian Shepherd Show Groenendael of the Year 2004! 2004.12.12 Swedish Winner Show, Stockholm. Judge: Mr Kurt Nilsson, Sweden. Excellent, 2:nd Best Male, CACIB. van Deijl, Holland. Excellent, Best Male, BOB, BEST IN GROUP ! Complete scissor bite. Excellent male. Nice size. Excellent coat and condition. Expressive long head. Excellent dark eyes. Excellent ear set. Straight muzzle. Well ciselled. Nice topline. Excellent chest and underline. Good croup. Well angulated. Good bone. Good presentation and caracter. Dog in supercondition and very showy. Moved well. Sibelle was Excellent and BOS. 2004.08.07 Swedish Breed Specialty - The Belgian Weekend - Stockholm. 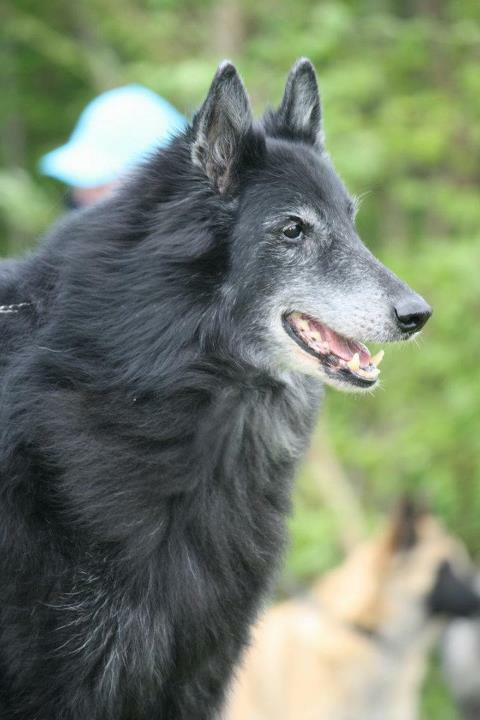 Judge: Mme Marie France Varlete, France Excellent, 3:d Best Male. 2004.06.12 Finnish Breed Specialty, Tampere. Sibelle was Excellent 2 young. Soya was Excellent 2 junior. Saphin was Excellent 1 junior with R-CAC. 2004.04.17 Swedish Breed Specialty, Gävle. 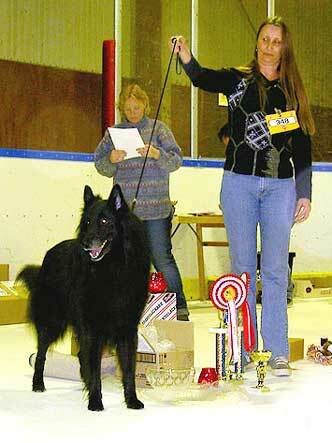 Judge: Mr Bo Skalin, Sweden Excellent, 2:nd Best Male. BIS-2 Champion. 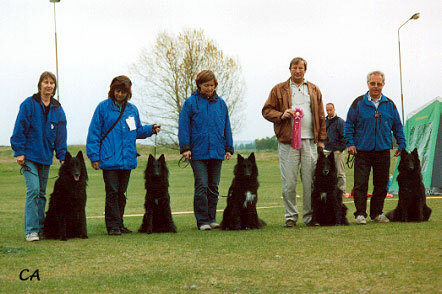 2004.04.10 Swedish Kennel Club, Stockholm. 2004.03.14 Swedish Breed Specialty, Stockholm. 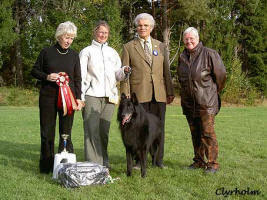 Judge: Mrs Bente Harlem, Norway Excellent, 2:nd Best Male. BIS-2 Champion. Baby sister Sibelle was BOS and BIS-Junior. 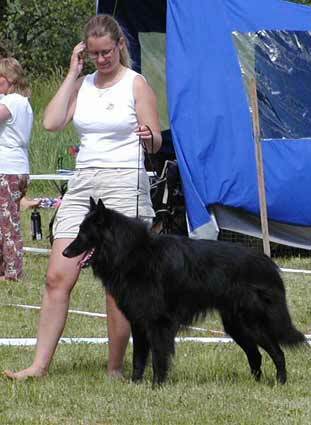 3:rd Belgian Shepherd Show Groenendael of the Year 2003! 2003.12.20 Swedish Breed Specialty, Christmas Show in Rimbo. Judge: Mrs Amanda McLaren, England Excellent, Best Male, BOS. His excellent baby sister; Sibelle, was BOB and later BIS ! ! ! 3 year old male of excellent overall type. Profuse coat of good condition. Harmonious silouett. Long expressive head, very well chisselled under the eyes. Beautiful dark eyes. Very good pigmentation. Forehead almost flat. Good stop and parallellism.  Medium, high set ears, the left could be slightly more triangular in shape. Good neckline. Excellent firm topline. Well developed chest and well defined underline. Well angulated in front and rear. Croup a little slooping. Very well ring presence. Male of excellent quality. Moved excellent. 2003.12.13 Swedish Winner Show, Stockholm. 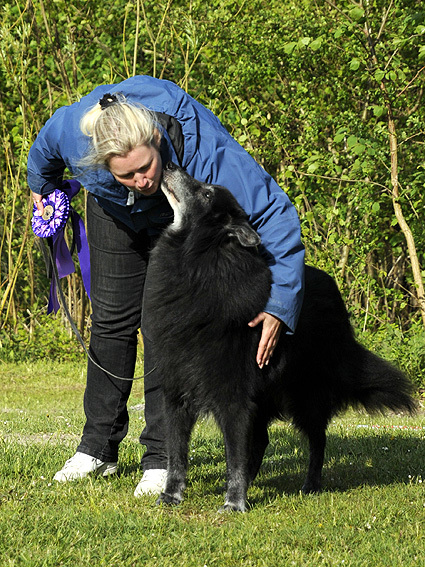 Judge: Mrs Marit Sunde, Norway Excellent, Best Male, CACIB, BOB. 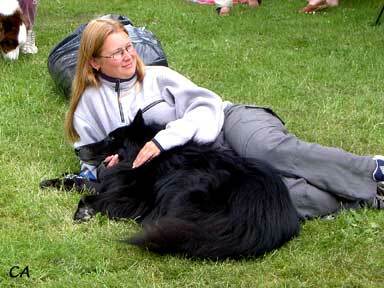 2003.09.27 Finnish kennel Club, Eckerö. 2003.05.17. Swedish Breed Specialty, Åhus. 2003.04.19. 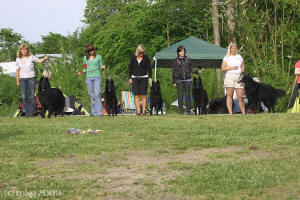 Swedish Kennel Club, Stockholm. 2003.04.12. Swedish Breed Specialty, Gävle. Excellent mentaltity. 3 years old. Complete scissors bite. Excellent dog. Good size. Excellent structure of the coat. Expressive long head. Good parallellity. Good stop, long muzzle. Excellent dark eyes. Excellent ears, well set. Nice neck. Good topline. Good croup and tail. Excellent forechest and depth of chest. Well angulated in front and behind. Good bone. Stands well. Moves regular. 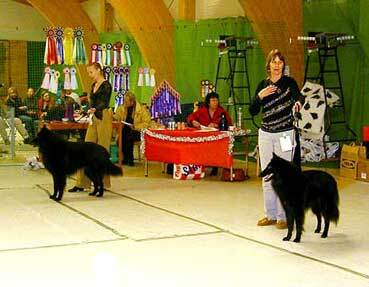 3:rd Belgian Shepherd Show Groenendael of the Year 2002! 2002.12.08. Swedish Winner Show, Stockholm. 2002.10.05. 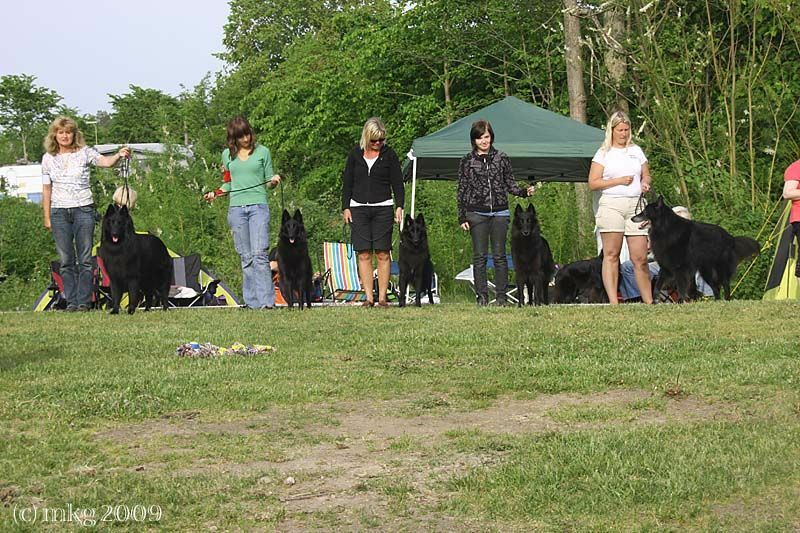 Norweigan Kennel Club, Fredrikstad. 2½ year, Complete scissorbite. Very beautiful and well ciselled head. Light stop and good parallellism. Nice dark eyes in almond. Little ears, well placed. Very good strong back with good croupe. Excellent developed chest. Very good angulation, rear and front. Good bone structure. Good cat feet. Excellent coat texture, not totally in condition. Very good position of his feet. Excellent temperament. 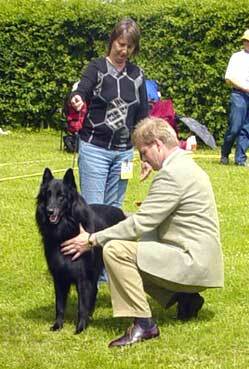 Judge: Mons Eric Desschans, Belgium 1:st prize, Excellent, Best Male. 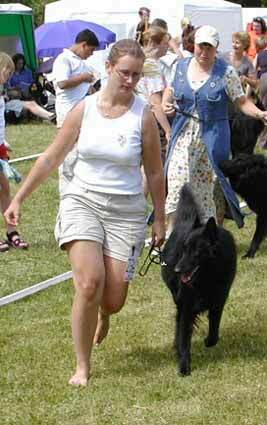 6:th Belgian Shepherd Show Groenendael of the Year 2001! 2001.12.15. 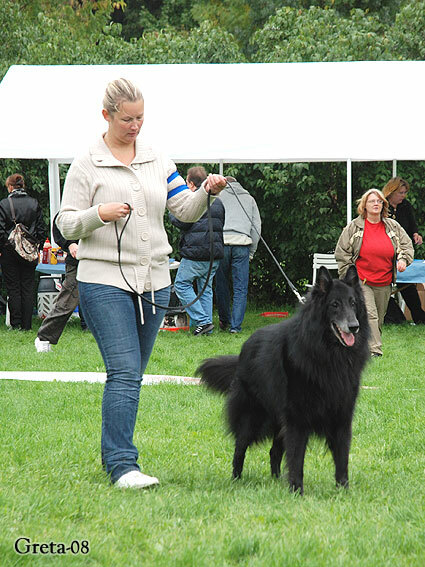 Swedish Kennel Club, Stockholm, "The Big International"
Scissor bite. Excellent size. Masculine silhouette. Square body. Medium long head. Good chiselling, parallellism and eyes. Medium ears. Good stop. Beautiful neck, topline and chest. Very good angulated. Good bone. Very good feet. Excellent presence in the ring. Sloping croup. Excellent movements. Very complete dog. 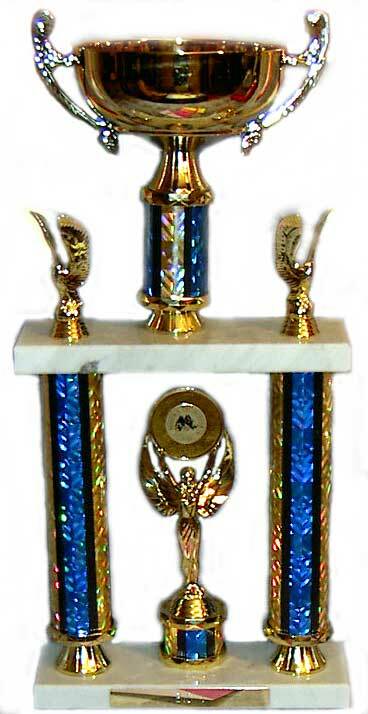 2000.09.09. Belgian Happening, Lidingö BK.